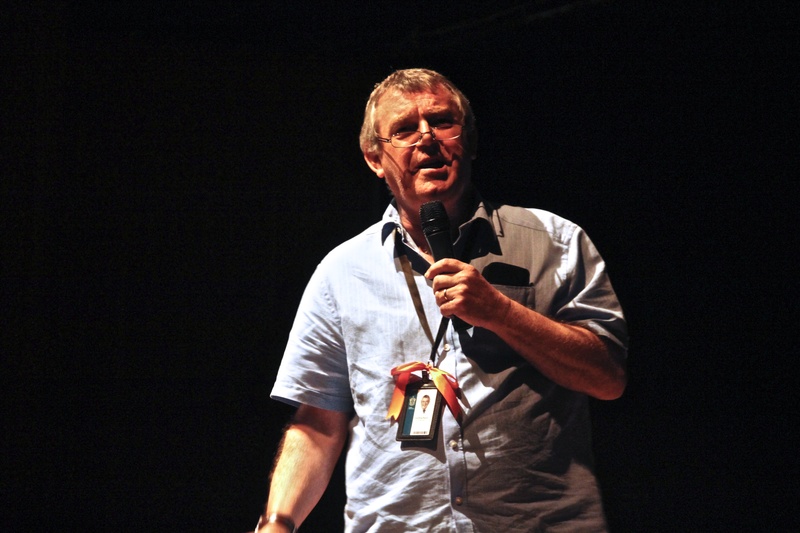 Two days ago, we published part 1 of our farewell interview with Mr Geoffrey Purvis, Humanities Tutor of 23 years who will be retiring back to the UK at the end of the year. 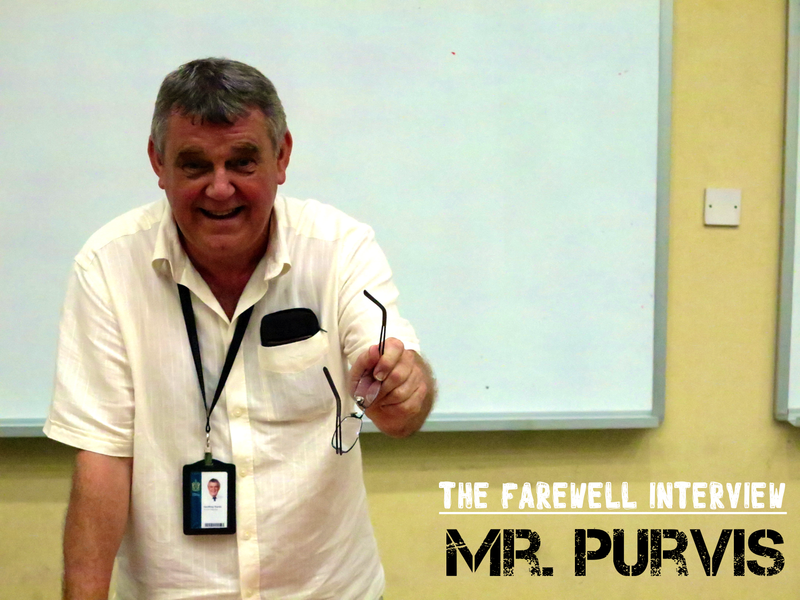 Today, we conclude the interview with Mr Purvis’s views on the future, for himself and for Singapore, and what he values in his life and his work. Have you ever encountered situations where students especially or parents have had trouble understanding your accent? Oh Yes. I do get that a lot. Many see me as a ‘Geordie’, but I’m really a Durham boy. ‘Geordies’ live north of the River Tyne; I was born on the south side in the county of Durham. People do have difficulty and I appreciate that. But the thing I’ve found most rewarding in recent years is the number of people who tell me how lovely my voice sounds – how they like the musical quality of it. They should come to Wales and the North East, they all talk like me there!! And that means a lot to me – because when I was at university I was very young, sensitive, and naïve, and I was quite hurt by the number of times people would say to me: “Where are you from then? Are you Scottish? Are you Irish? Are you Welsh? What, English?! !” Suffice to say, I shut up a lot of the time I was there. Here people ask me if I’m an Australian! Which is completely mad – I don’t sound anything like an Australian! I used to teach students to speak in Geordie. I taught a class once to say, “I’m going home” in Geordie – ‘Ah’m gan hyem’ – it was really funny listening to them having a go and making a mess of it. Tell us about the most memorable moments you’ve had while teaching. 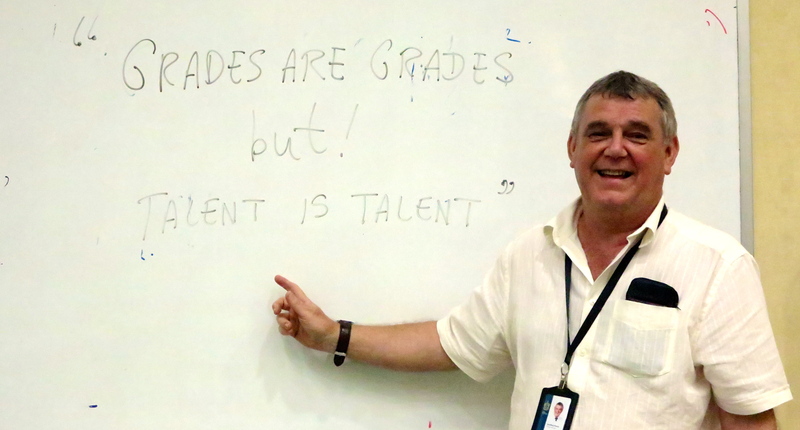 What will you miss most about Raffles Institution? 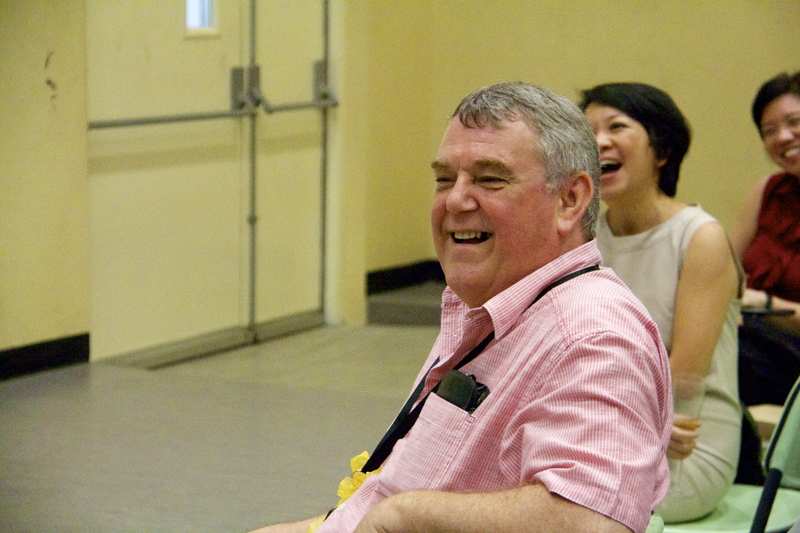 My colleagues – I think Raffles has some great teachers, and I’ve been really touched by the number of staff who’ve come up to me and said: “We’re gonna miss you around here”. That’s nice. There’s a great atmosphere in the staffroom. 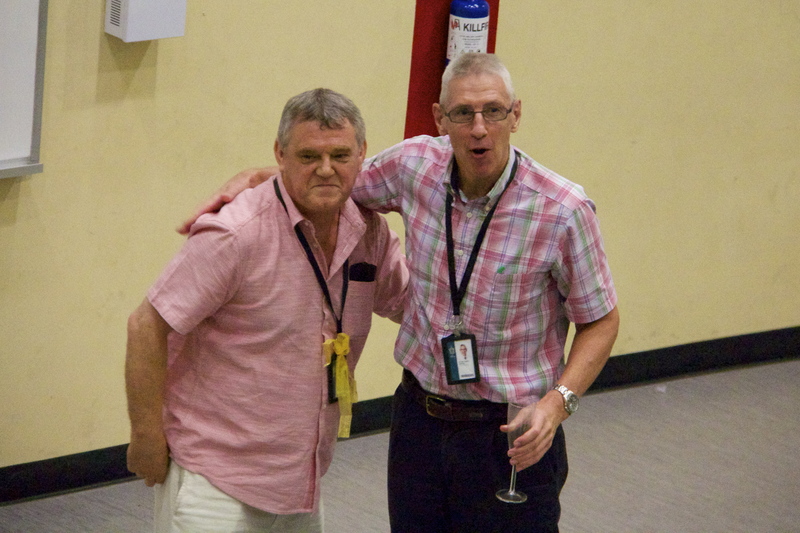 Mr Purvis with Mr Jamie Reeves, both colleague and friend throughout his time in Raffles and Singapore. So what do you think of the school and the changes its been going through, with the Singapore educational climate and all? I’ve got a lot of admiration for the staff here at Raffles. I think there’s a culture in Raffles of not having too many meetings – not sitting and talking endlessly about theory. Staff just get on with things. I don’t think I’d have stayed as long in Singapore as I have done if I had not been at Raffles. In some schools, principals think nothing of holding court in staff meetings for three/four hours non-stop. I’d hate to have to put up with that. I don’t think much of the Raffles Diploma, to be honest. It’s a lot of fuss and bother over nothing and takes us back to the dark ages of having everything quantified by a numerical score – which is manifest nonsense. Project Work is useful for the developing of oral presentation skills, but that’s all. The amount of man – hours spent assessing written reports and who’s done what and where and when seems ludicrous to me when everyone ends up getting more or less the same score. Or, what’s worse, when you get what I have got in some of my classes– only one B in a class of otherwise straight As. Come on, that’s bizarre!! Do you have any regrets upon leaving RI? What do you plan to do after retiring? Well, we have a house in Hay-On-Wye (in Wales), which is known as ‘the town of books’ – and I expect to see a lot of students coming through, checking out the bookshops. The house needs refurbishing and repainting, so I’ll be doing a lot of that. I hope to do a lot of reading and travelling! Going and seeing bits of England I haven’t seen, seeing my old friends. My wife is a keen animal lover, (I tell my students that’s why she married me!) She wants not one but two dogs; we already have two cats, one called Holly and the other Lulu. One of them in fact looks like my late mother-in-law. It’s true! She lies on the floor, looks at me and says unsmilingly “ I didn’t think you weren’t funny when I was alive and I don’t think you’re funny now.” I’m not really an animal person. I was brought up without any animals – no dogs, no cats – and I’m actually really uncomfortable around them. I find it fascinating that I’ve been teaching the novel Disgrace with the previous year’s Year 6s – and that’s about a teacher who loses his job, goes to stay with his estranged daughter and ends up working with animals, and re-establishing the connection between himself and the animal world. Art imitating life? My wife thinks I would’ve been a different person if I’d had animals in my life when I was younger, and it’s not too late to reconnect. So I see myself walking the hills of Wales with my two dogs and my wife. I’m looking forward to it. Would you ever consider coming back to Singapore to visit? I don’t think I’ll be able to afford it! I think sometimes it’s a danger to come back. I will come back some time and have a look but not for a while because I’ve had my time here and it’s time for other people to take over from me. I think things are changing, generally, and I’m a little bit concerned about the attitude that seems to be developing in Singapore towards foreigners and the expatriate teachers are kind of becoming involved in that. There is resentment of the fact that they’re here and teach Humanities students when Singaporeans could be teaching them! That concerns me because if Singapore becomes too parochial, then it’ll suffer for it – we need fresh talent, we need to have immigration, we need to have people coming in to keep things fresh, keep things vibrant – or else we’ll end up like Japan, completely insular – if you’re not Japanese you don’t count, and I’ve never wanted to live in that kind of world. One of the things I’ve always loved about Singapore is the multi-racialism here. What are some of the values you believe in? I value Integrity, honesty. I don’t like people who pose. If Literature teaches us anything it is to dislike pretense, pretending to be what you’re not. I’ve got a sign on my desk that says, “Be nice or leave” and I think we underestimate kindness – the value of kind acts and kind deeds. Feeling and showing compassion are two other ‘literary’ values. I do my best to try and care for people, care about people. I started life in the church, as all my students know, and those values never left me. I got rid of the dogma but I’ve hopefully kept the best of the values. I like being able to think freely. I don’t like thought control of any kind – whether religious or political. I think we should be free to think as we wish, and not worry, as George Eliot said, what damage it might be doing to our eternal soul. These are some important values for me – integrity, compassion, concern for others. Some students would be surprised at which of my students are the ones I value the most. There’s a girl I called Chanel Number 5, lovely girl; a girl called Kelly Chan – lovely, caring individuals, warm-hearted people – and I think any teacher would tell you, that being clever’ is not what it’s all about. What it’s about is being the kind of person other people want to be with. In the world today, what do you think society values the most? I’m very concerned about the way the world is going – I think we seem to feel that capitalism has won, and I don’t think capitalism is anything like the perfect system. The crass materialism of the world concerns me too – you see, the old religious values never leave you! I think there’s something wrong with this obsessive preoccupation with money. It’s a common assertion in all Literature texts that money does not bring happiness. It can help you be happier, but in itself it’s not as important as other things. Literature teaches us that other things are far more important such as relationships. I think that’s one of my core values as well – people are far more important than principles. If I had to sacrifice people or principles, it would be principles. Because when I was in the church my family put their principles before me, and so it created a great division and I think that was a huge mistake. And I tell students about it often, because I know it happens in Singapore. Children become Christians and their parents still have their Chinese idols on display and it causes the family to fracture. I think that’s rather sad, because the family shouldn’t be allowed to fracture, it should be kept in its place, because relationships are much more important than beliefs. What is the most important piece of advice you could give to any student, past, present or future? I think it my wife would say: don’t believe a word I say! I think it’s a sense of perspective – as I am fond of saying in class: grades are grades but talent is talent. This school is all about people trying to get good grades – but I think people have to realize there’s more to life than that and that’s what I mean about perspective. Especially in Singapore – I think we need to keep an international perspective rather than becoming totally preoccupied with the red dot as if that’s all there is. What’s the most important thing that you think people should know? My strong sense of humour has saved me so many times from (a) complete depression or (b) complete self-absorption as a teacher. I’ve learnt to laugh at myself and to say with Puck: ‘Lord, what fools these mortals be.’ The ability to laugh at life is priceless. People criticise Rafflesians about being arrogant and elitist – what do you make of that? Do you think it exists? Do you think it’s a problem? I think in some students it is, yes, but it’s not their fault- they’ve been brought up that way. I think some of the RI mothers are to blame for the way their boys behave like little Caesars. That’s what I was worried about when I first came to Raffles. 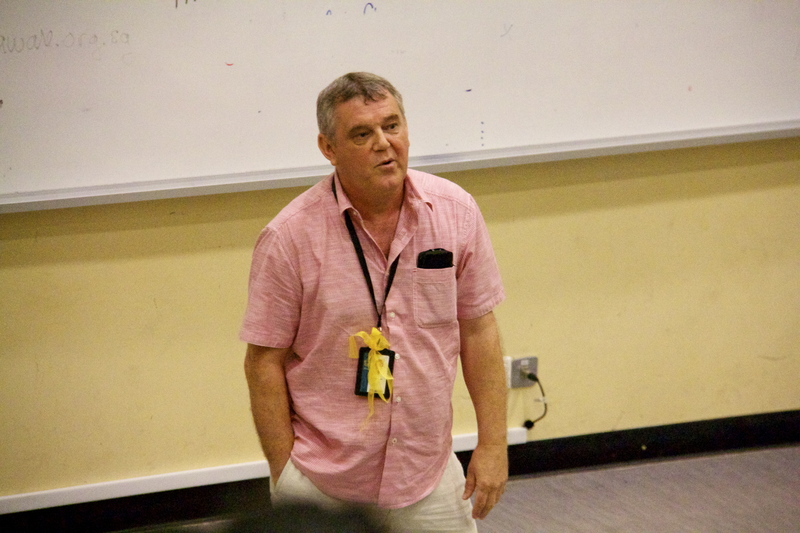 I was quite apprehensive because at Anderson I’d heard all about Raffles and seen Raffles students on television debating and thought, “Wow, these kids are good” – and I was expecting all the students to be like that when I arrived. However, I found the number of really outstanding people was very small. Most of the people I’ve worked with have been only too conscious of trying to live up to this image of being a clever Rafflesian – when they know they’re not, and the image intimidates them as much as it intimidated me. I don’t like this repeated emphasis in the school on leadership. My friend Mr Bachelor who used to work with me was my idea of the perfect leader – he didn’t want to do it; he kept having it thrust upon him as Shakespeare put it. I know I would follow leaders like Mr Bachelor any day because he was a man of integrity, and he never asked me to do work he wouldn’t do himself. I don’t like seminars on leadership, I don’t like people telling me what makes a good leader, a bad leader, all that – I mean what makes a good leader? I don’t know. And those who say they do have never led anybody anywhere except to buy their latest book. Because education gave me everything – it freed me from the shackles of the church, it gave me the opportunity to come to Singapore, it gave me the opportunity to travel the world, it gave me the chance to open my mind up, to feed it with all sorts of wonderful books, and that’s why I became a teacher – because I wanted to pass on what I saw as the benefits of a lifetime of education. I’m on a nonstop process of learning – I often joke that what they’ll put on my tombstone are the words “None the bloody wiser”; it’s not strictly speaking true – I do know more than I did when I was younger, but I’ll never know all I want to know. Never. Finally, if, when you went back, someone asked you for one experience that stands out for you in your entire time in Singapore, what would it be? That’s difficult… I’ll pick something that happened recently. A couple of years ago, only one person in my class did not get an A or a B for ‘A’ level Literature and she wouldn’t come and see me because she was too upset. So I went looking for her, and I found her crying. She had let me down she said. I told her she hadn’t at all. She was still the lovely girl I used to sing to in class. And yet I thought at the same time, this poor girl will have to carry this moment with her for the rest of her life. And how unfair that is. Some who’d got As were no different academically to her. It happens every year: this day of dreams coming true for some becomes for others their worst nightmare. I’ve thought a lot about that since and talked about it to my classes. A poem has even been gestating in my mind in which the last line of every verse would be the same: ‘And (…) has a boyfriend’. I was delighted to find that this girl ‘has a boyfriend’ – it’s no consolation prize; love is the greatest treasure anyone can find. It’s students like this girl that I remember with affection, the students who don’t do as well as the others do. That must hurt in a school like this, and I don’t think the school makes it easier for them, beginning the issuing of results by parading and trumpeting the huge successes of the stars. I’m so glad you did this interview. It just reminds me how much we will lose when Mr Purvis goes. Please add a link to part 1!